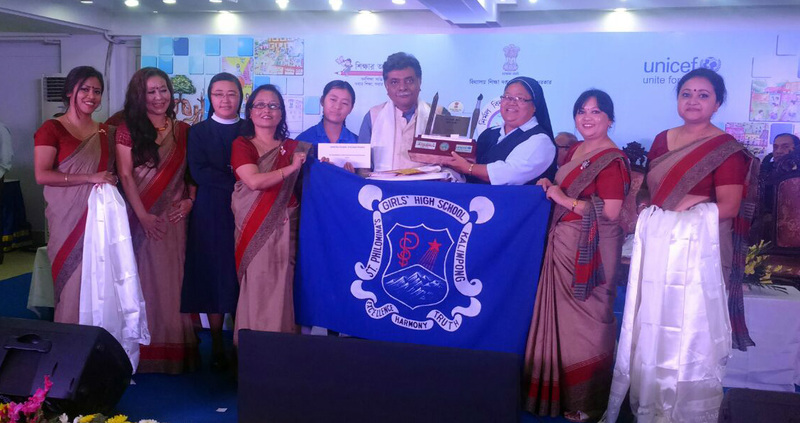 Kalimpong Saint Philomena’s Girls High School has received the prestigious Jamini Roy Memorail Award 2016. The School which outclass mostly all School in academic excellence in Kalimpong . The School Principal Sister Crisanta Rai along with her teacher and a student received the award from the hands of Dushyant Nariala, IAS, Secretary, School Education Department at a program held on 11th December at Town Hall Calcutta which program was presided by Hon. Education Minister Sri Partho Chatterjee.The program was organized by UNICEF and School Education Department. Saint Philomena School in recognition of the outstanding effort made for advancing W.A.S.H, education and aesthetics intervention and adoption of child friendly norms and standard in the school was choosen for the award from Darjeeling District. The school is among 3 secondary school in the whole state selected for the prestigious award along with a amount of 50 thousand rupees. St Philomina school had bagged Nirmal Vidhalaya Award in 2013 and ShishuMitra Award in 2014 after which this is the latest in kitty. The school will also represent in the Divisional level Youth Parliament next month at Balurgat after winning the Darjeeling District Champion last week informed Rai. 0 Respones to "St.Philomina receives Jamini Roy Memorail Award 2016"